Little man started school two weeks ago and is absolutely loving it. 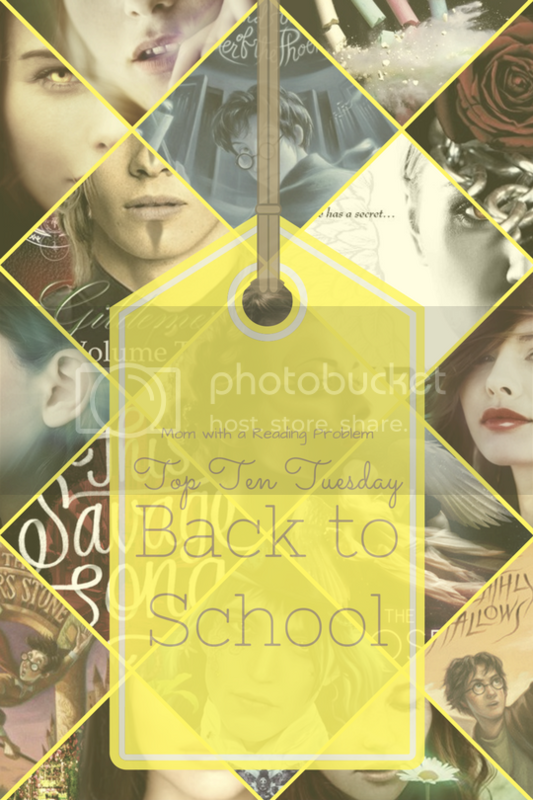 This week’s topic is “Back To School Freebie” so I decided to chose my favorite books that feature characters heading to school. As always, the books are in no particular order and titles link to review/Amazon (affiliate). Harry Potter series by JK Rowling: I adore the Harry Potter series. It is one of the first young adult/middle grade books I read as an adult. I like that the story is set to the backdrop of Hogwarts, a wizarding school. It’s a fun mix of school, friends, and adventure. The Unearthly by Laura Thalassa: In the same vein as Harry Potter, The Unearthly series is set in a school for the paranormal. The series features vampires, faeries, witches, wizards, were-creatures, shape-shifters…you name it and I bet you 99.9% of the time you will find a character that matches the creature you’re looking for. It’s a paranormal romance for the mature young adult crowd and I loved every word! Gildemer by A.S. Oren: This is another series that is set in a school. The author has created an entirely new world featuring humacats (human, cat hybrids). It’s an interesting read and each volume features 4-5 shorts that read like watching your favorite sitcom/drama. The Chosen Knights by Mary Ting: I literally just read this book this month and it tops this list! The series is about nephilim that come to earth and disguise themselves as high school students to find the cause of increased demonic activity. It’s an interesting take on angel mythology and a fun urban fantasy read for young adults. This Savage Song by Victoria Schwab: While it’s a bit of a stretch to include this book in the list, I did anyways. The two main characters meet at high school and bond over being the outcasts. It’s a great fantasy read! Curse of the Sphinx by Raye Wagner: I read this book in the Spring and devoured it! The series is about the Sphinx (Egyptian mythology) and how she tries to avoid the demigods that rule school. If she’s caught, she will be killed. It’s a page turner and I loved the blend of mythology with the urban world. Eerie by C.M. McCoy: Like The Unearlthy series, Eerie is set at a school for the paranormal. The characters learn to use their gifts and about the paranormal world. It was a fantastic read that I read in just over a day and cannot wait for the sequel! The Delta Girls series by Juliet Madison: This series is so much fun. Each book could be read as a standalone, though I highly recommend reading them in order. It’s about 5 sisters who together have psychic abilities, each sister can sense the future through one of the five senses. Very cool concept and fun mystery/urban fantasy series! Plus it’s clean for the younger young adult crowd. This is Where it Ends by Marieke Nijkamp: This was the first book I read this year and I cried like a big baby. It’s heart-wrenching and a terrifying page-turner about a school shooting. If you have triggers, don’t read it. This book reads in real time and takes place over the course of 45 minutes. It’s an intense, highly emotional read. Unhinged by A.G. Howard: I love all things Wonderland and I LOVED this retelling. But book two of the series is my favorite. I love Morpheus and I loved when he appeared in Alyssa’s high school. Fabulous selection of books. I have the Harry Potter books and loved everyone of them. The rest…thanks for sharing some new to me books. Fun list. I’m kinda curious about The Unearthly- a school that caters to all those paranormal type creatures sounds fun! And it seems like I looked at something else by that author too- her name looks familiar. Will have to check those out! Laura Thalassa is great! I haven’t read anything by her I didn’t like. Hope you like The Unearthly! Very interesting list, though I’ve never read any of these. The little blurb your wrote about The Chosen Knights really captured my interest. The Chosen Knights was a great read. I really enjoyed the angel mythology mixed into today’s world. OOoh nice picks! I sooo need to up This Savage Song in my reading queue! I initially was going to wait and binge the duology next year, but I decided I can’t wait that long! But yet, I still can’t manage to get it up in my reading queue either! LOL! Great picks! The Unearthly is one of my favorite series by a favorite author 🙂 I have yet to not like any of Laura Thalassa’s books. They’re all good IMHO! This is Where it Ends is the first book I read this year as well. I think. It was a powerful book. I still think about it from time to time. Me too! It was such an emotional read but really opens your eyes to the possibilities. The only one of these I’ve read is the Harry Potter series (love!) but a few of the others are on my TBR.